The blue and white of old delft in the living room is repeated in the front bed room The lovely blue and white bed hangings were sewn by Penny and now used on this bed Jack made some years ago. 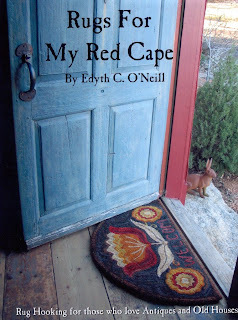 The fabric was given to me by friend Jeanie after our house fire burned all the ones we had at that time. 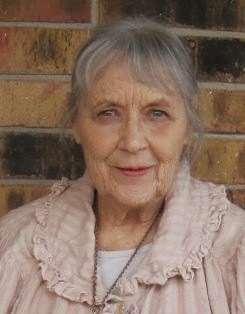 I was not able to make them however and so gave the great fabric to Penny, with Jeanie's blessing. Now they have come back to me as Penny makes changes and is sewing some lovely bed hangings of crewel embroidered fabric for her home. Cast your bread upon the waters! I will lay the old handwoven bed tick and two shams on the foot of the bed to add interest. Note the weaver's red initials on the white sham. The major pieces in this room reflect Jack's taste for furniture that reveals a cabinets maker's skills using choice woods in glorious grain. Jackie spent so many happy times in the old homes of Historic Deerfield, studying the 18th century furnishings by renowned Early American cabinet makers. 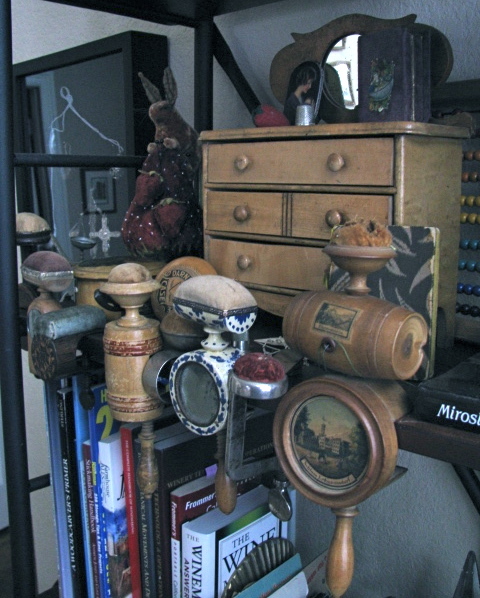 The earliest pilgrim century furniture to which I was drawn spoke more to him of England, the mother country. A few generations later the Americans had reached a confident mastery of their art and this is the furniture that resulted. Good morning to a fresh new day just breaking here in central Texas. After some hard days for our country it is time to start to heal and turn toward renewal. The unusually cool night for this time in April made me thankful that my tomato plants are still all in pots so they could shelter on the glassed-in porch last night. A young man is coming to help with some changes in the yard. I am taking it slowly with this new space. I have been in this smaller home for almost a year now, and have begun to shape the garden by replacing very overgrown old shrubbery with more plants of my choice. I always am guilty of planting more than I can take care of. This time will likely be no different, but at least there is the constraint of a tiny lot. There will be areas of mulch, and less grass to water. My body asks “no more gardening please” but my spirit says “just a little bit?” Small as this plot may be, I have a front yard, a side yard, a back yard, an atrium, and a sun porch, all wanting plants! It is truly a garden home as adverised by its builder. I favor white flowers over colors, but include some blues and purples and a bit of yellow. The play of different textures in the planting adds pleasure also. 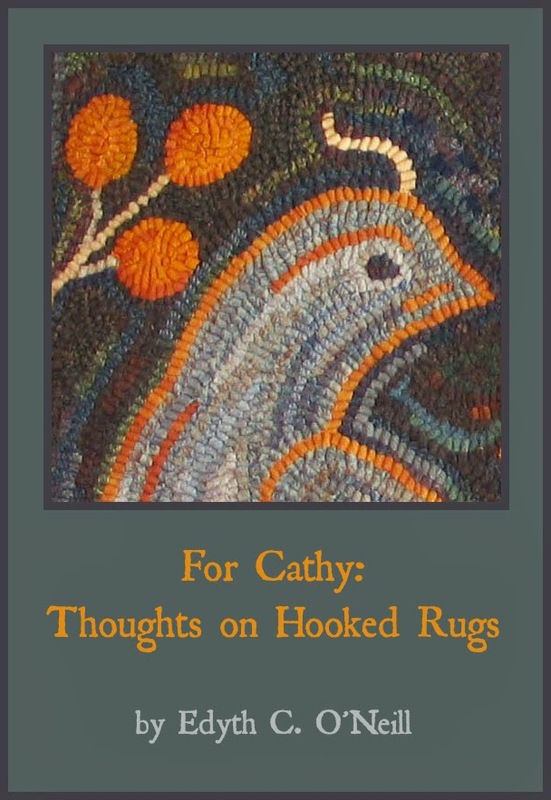 The recurring considerations of design and color and texture are another iteration of the guides for hooked rug design which steered me in that pursuit. 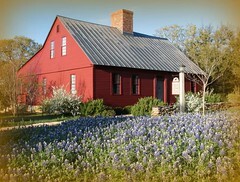 Gardening is not greatly different from painting except for the amount of physical effort required. 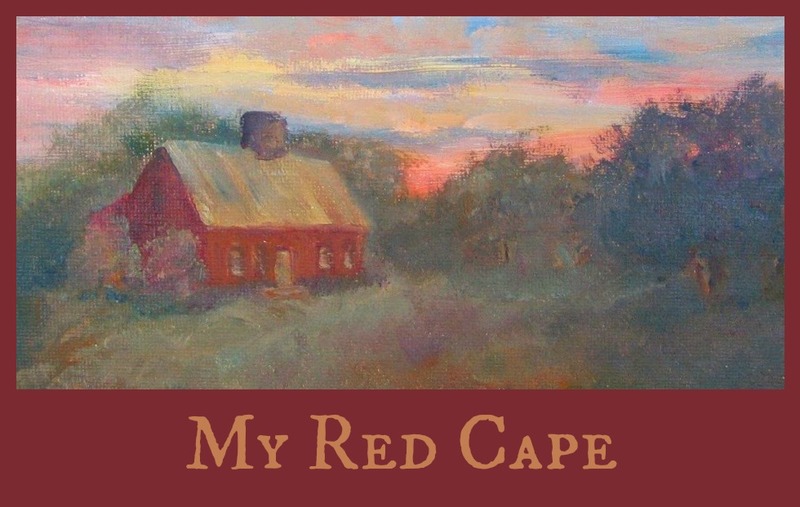 I find that painting can be challenging for me now also, if I want to enjoy the currently popular plein air painting. Thirty some odd years ago I painted as an income producing full time artist. I painted imaginary children in early styles and poses for the country decorating so popular at the time. Now I paint only occasionally and just for my own pleasure. Rarely does a friend come in and ask to buy a painting. There are millions of people painting landscapes now, it is a fine way to enjoy the outdoors and the beauty of creation. Important Cloth dolls at auction. 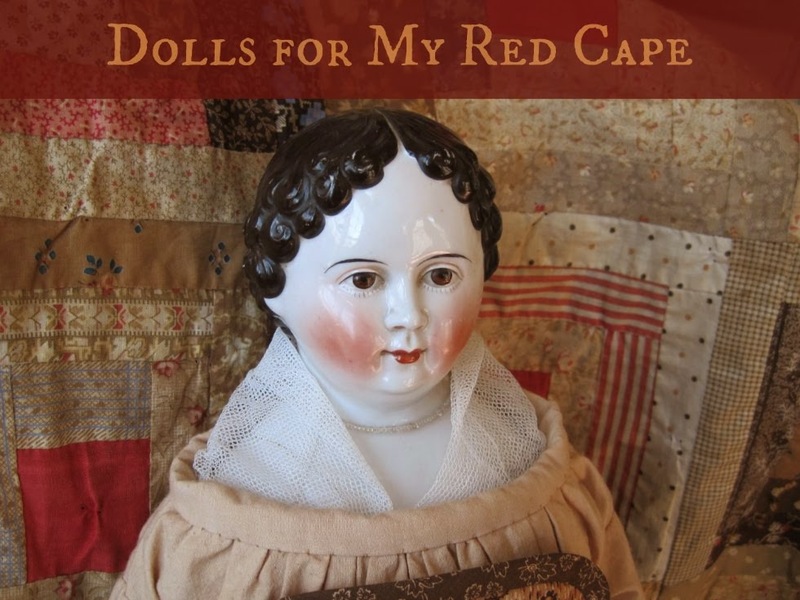 Here is a link to the picture of a great oil painted face cloth doll to be auctioned by Theriault's this week. 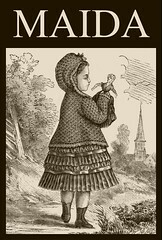 I have long had a picture of this doll in my scrapbook. 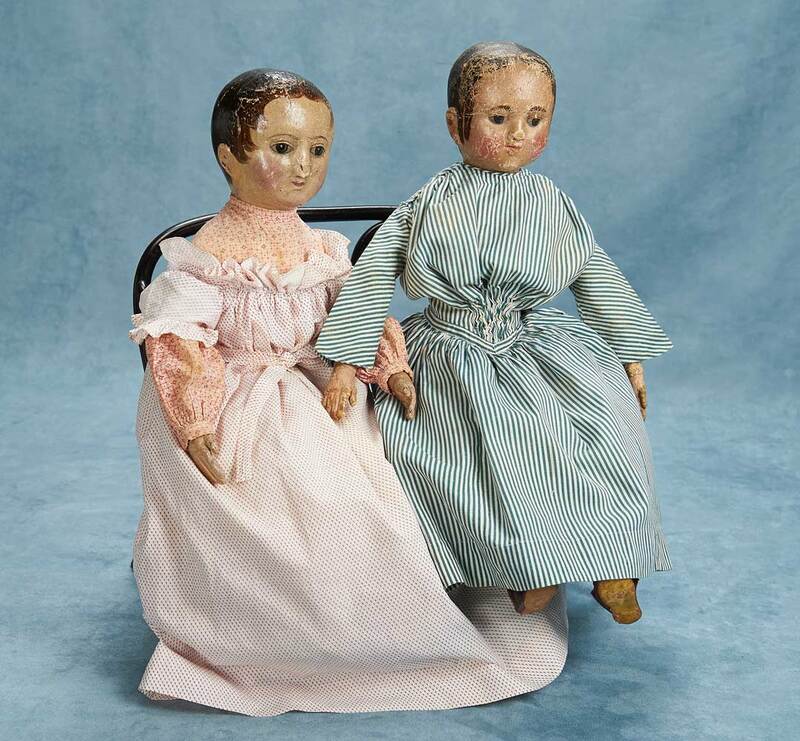 The same catalog shows two Izannah Walker dolls at auction. It will be fun to see what they bring. The glass eyed children by Voit are among my favoite dolls. Prudence as I have named her is a precious toddler 29 inches tall. 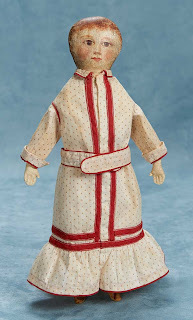 I redressed her this week in two garments made for an infant of the mid 19th century. Prudence dates about 1845 so I was thrilled to find this dress and little bib/apron for her. The hand stitching on these garments is almost too fine for me to see. Is this not one sweet print! The dress was drawn up on several gathering strings to fit the current baby, and could be straightened flat for washing. Shaping on such a dress is minimal, the drawstrings do the fitting. This one was a bit too long for the doll, so I lightly whipped a hem in it, and only finger pressed it, not wanting to really alter or damage the dress which is an antique in its own right. Living Green is a matter of thinking green. When God started us out in a garden, He had me in mind. The pleasure of breaking off crisp full broccoli heads is easy to understand. Perhaps cutting a few hands full of baby spinach leaves to go in a salad is understandable to most also. There is a bit more work involved in harvesting the rich green parsley before it bolts and is gone for the hot summer. It is spread in a broad pan to dry on my sun porch before going in a jar for the kitchen. These few things have come from my garden today, planted among ornamental plants, but more beautiful to me than the bright faces of pansies. This far some could understand, even if it is very easy to buy parsley already in a jar. But how to explain that sometimes the clear water in my dishpan from rinsing store bought berries is poured into a watering vessel to end up watering my atrium plants instead of going down the sink. How to say why I cut up the stems of the harvested parsley and toss them back on top of the garden mulch. Why do I bury the apple core and strawberry tops and other green trimmings in the garden soil to draw earth worms to my garden? These tiny gestures from a one person household cannot make any real difference to our mother Earth. This way of enjoying my tiny yard makes sense only because it makes me the gardener happier. Living intimately with my garden feeds me in a fundamental way, far beyond the little tomatoes forming there. I am thankful to have a garden again for this first Spring in my new home.